Have you considering investing in your home by remodeling certain aspects of it? If the answer to that question is yes, you are probably also curious to find out how much of your investment you will be able to recoup once you decide to sell your home a few years down the road. These remodeling ideas to increase home value will show you some of the things you can do to recoup costs and generate a profit at the closing table. Here’s the thing…many remodeling projects will add less resale value to your home than what they end up costing you. However, by taking on a remodeling project you will get to enjoy the benefits of living in a remodeled home which in itself will justify spending part of the money on the different upgrades. Even though you are willing to spend money on your home, it is smart to find out upfront how much value the project will add. The answer to this question is not completely straight forward. For example, the value added by replacing an old kitchen will obviously be higher than if you are to replace a fairly new kitchen. Clearly, the older kitchen will have a lower resale value than the newer one to begin with. Each year a remodeling cost vs. value study is accomplished to examine popular remodeling projects, their average costs, average resale value and thereby also the cost homeowners will typically recoup through the increased value of their home. 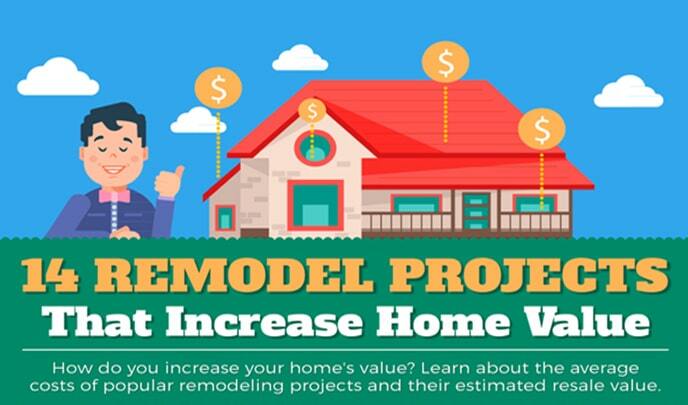 This information has been turned into an easy-to-understand infographic about remodeling projects and their return on investment which at the same time looks at the most important remodeling ideas to increase home values. You might be tempted to simply choose the contractor that is able to provide you with the lowest offer, but is this really a good idea? Often, if their offer is significantly lower than the offers from other contractors, it might be a sign that they either do not carry the necessary licenses and insurances, or it could be a sign that they are going to be cutting corners, essentially meaning you will not end up with the final product you were hoping for. Make sure to always check contractor references, and remember the saying, “If it sounds too good to be true, it probably is”. If you have completely unrealistic expectations when considering the amount of money you are willing to pay for the remodeling project, you could attract bad contractors. They are the ones that will take your money and move on to the next project, long before you realize all the things they did not do properly. Respectable contractors will know more or less how much a given project will end up costing after inspecting the room that needs to be remodeled and after sitting down and talking with you in order to understand your expectations. If they get the feeling that you are not willing to spend the money required for the kind of project you are looking for, they may provide alternatives that best fit your budget. Reputable contractors will not try to sell you something you cannot afford! Have you ever been in the situation where you walked into another person’s kitchen and thought, “Wow, this is so trendy and amazing.”? Choosing the most modern remodeling options may seem like the best solution, but these are typically not the ones that add the most value 10 years down the road. Trends change and choosing this year’s top style might not be very appealing several years from now. If you are less concerned with the value added to your home, it might however be just the solution you have been looking for. This is especially important if it is a project like house siding replacement or another exterior remodeling project. You may want to consider choosing a style that matches the surrounding houses as this will give you the greatest return on your investment. If you are making upgrades that are a lot nicer than what can be seen on the surrounding houses, you may have trouble finding buyers for your house that are willing to pay the premium of your upgrades, as these remodel upgrades appeal to buyers that are not interested in living in that neighborhood. Certain types of remodeling projects may add to the overall requirement for maintenance, which is something you might not be ready for. Obviously, this concern will not apply to all kinds of projects. An example where the needed level of maintenance may change could be when installing a new kind of house siding. You may currently have vinyl siding on the side of your home, and you have been looking into switching it out with wood shake siding. However, the new kind of siding requires a lot more maintenance, an aspect that may end up bothering you if you were not aware of this prior to having it installed. Below are 14 remodeling ideas to increase home value to either improve your resale opportunities or provide many years of family enjoyment. When talking about replacing a garage door, you should consider buying an insulated one if your garage is attached to your home as this may help lower your electricity bill. It is also important for aesthetics and to keep you on the right side of your homeowners association (if your neighborhood has one) to choose a style that not only compliments your house but also matches the neighborhood theme if there is one. For areas that experience high winds, ensure your garage door is reinforced to withstand all mother nature throws at it. The same applies if the garage is detached from the main property. When you eventually get ready to sell, you do not want the garage door to be something buyers notice in a negative light. Instead, you want it to add to curb appeal of your home and increase the likelihood buyers will want to see the rest of the house. If you plan on living in the home for several more years, an important consideration is the type of siding you install as they require different types of periodic maintenance at sometimes varied intervals. It is also smart to do your homework and choose a siding material that will last a long time, looks aesthetically pleasing, and holds up to the environmental conditions where you live. While many go with traditional (and low cost) vinyl because of how easy it is to install and maintain, some homeowners may decide to go with fiber-cement or foam-backed vinyl choices. When comparing the various types of siding materials, ensure you take into account the cost per square foot to keep your investment affordable. There are a host of popular house siding options available on the market so pick one that meets your requirements and enjoy the look of your house for years to come. It is hard to discount a low maintenance product that is fade-resistant and in some cases a lifetime transferable warranty. Because the elements differ from locale to locale, make sure you choose a material that will withstand whatever the climate in your area is like. It is also important to take into account the type of decking materials you use as some can get extremely hot in the summer heat. When deciding if a deck is a smart addition, it is important to take into account the normal wear-and-tear the surface will receive as well as any strain put on the railings and stairs. Composite materials are popular in many areas but their popularity raises the cost to install significantly. For many budget conscious consumers, a well crafted wood deck will provide the same level of enjoyment at a fraction of the cost. Whether your intent is to increase the value of your home or just to add some outside entertainment functionality, a wood deck addition is well worth considering. Because the kitchen is one of the most important rooms in the house, as long as you make wise remodeling choices, you stand a good chance to recoup your job costs and increase resale value with a minor kitchen remodel. The key is to stay within budget and not get carried away by scope creep. They have even proven to be recession proof with a very high return-on-investment over the last 15 years. Remember to leave between 3.5 to 4 feet of walkway space between areas as the kitchen is prone to congestion, especially if you have several individuals who live in the house. When done right, cabinet refinishing can save a lot of money and look amazing. It should be considered over cabinet replacement if you are on a tight budget and have other needs that require attention. If you are having a major kitchen remodel, chances are you are also replacing appliances as well. Make sure the new models have enough capacity to handle whatever your family needs are. It is also a good idea to stick with the same brand and style for cohesiveness and a unified look. If the kitchen has a nice flow to it, and plenty of work-space room and storage options, buyer interest will start high. New flooring, back-splashes, lighting, hardware, etc. should compliment all the other changes you are making to give a warm and inviting feel to your kitchen. The finished product should be very functional since in many households it is the central hub where family and friends often hang out. Kitchen remodels are king, and sometimes the queen too, of remodeling projects. New windows are a great way to add value and also help save on energy costs! If you take into account what your new windows will save you long-term, this might be a great project to undertake. Unless you know exactly what you are doing, pay professionals to hang the windows and ensure you understand exactly what your warranty covers and for how long a period it is good for. In addition, while you may be tempted to save money by purchasing an off-brand, it is important to understand the window brand may not be available if you need to replace one or more in the future. When installed correctly, they will open and close easily and should increase the energy efficiency of your home. If you add a decorative feature to your windows, make sure it blends in with the rest of the homes in your neighborhood. Ensure you get the proper permits, check with your local building department, and clear the conversion through your homeowners association before taking on a major project like this. If you undertake an attic to bedroom conversion, installing windows in the attic can save you energy costs as the natural light could help lessen the need for electricity use. So you do not end up with a bunch of “stuff” that is not functional in the new space, outline exactly what the layout of the new bedroom is before purchasing new furniture. With the recent trend of multi-generational households this renovation option can be a cost effective approach to increasing space without expanding the size of the house. In some areas of the country, basements are the norm. In others, like in Warner Robins GA, they are not often found. If you decide to take on a basement remodel, ensuring you have adequate lighting should be a consideration. Also be mindful of how high the ceiling will be. The last thing you want is a new space that is not high enough to be functional. In addition, because of the potential for water intrusion, make sure you check out all of your material options before taking on this project. If your basement square footage is not already included in your homes overall square footage, it is imperative you file, get approval, and have the space inspected by a licensed pro to track the update or addition to your home. If you live in your home long enough, at some point you will probably need to consider replacing the roof. Only hire experienced professionals and make sure they properly and adequately vent your roof and provide the correct amount of overhang to protect the roof from wind damage. Make sure your roofers provide everything they are supposed to and like all major projects…trust but verify! A key is to choose products that match the slope of your roof to keep water penetration to a minimum. If water gets under your roof that moisture collection can cause both health concerns and serious damage. Finally, the color and style should compliment your home and not stand out from other roofing options of homes in the local vicinity. One of the easiest ways to get yourself in trouble with a bathroom remodel is to not use a licensed professional to do the work. Just because your friend has an uncle who has a brother who is good at Do-It-Yourself does not mean you should hire him to redo your bathroom plumbing. Spend the necessary funds and avoid future issues! Otherwise you may realize the profits you expected went straight down the drain instead. If you decide to do some of the remodel work yourself, take your time and get it right. Crooked tiles, leaky faucets and toilets, uneven grout, and even sloppy paint/trim work can be a major detractor for some buyers when you are ready to sell the property. Also, look for ways to add storage that serves a purpose and adds functionality to the overall space. The same rule applies here, use a licensed plumber and avoid any messy issues going forward. Water can do considerable damage to a home so make sure the products being used are designed to be used in a moisture rich area like the bathroom. Natural light is always a pleasant feature and can make the space look more inviting and larger at the same time. Of course, there are a plethora of shower/bath options that can be relaxing, highly functional, and practical at the same time. Also, because room additions involve several disciplines (plumbing, electrical, carpentry, flooring, painters, etc.) it is advisable to have a detailed estimate of all the costs to avoid cost overruns. For growing families, who intend to stay in the home for several years, a bathroom addition may make perfect sense. I would be thinking more room for storage and my husband would put car/motorized toy protection as the reasons for adding on a garage. Your reasons may be similar or completely different, just ensure whatever reason(s) you have for adding a garage you allocate enough space for everything you plan to put in the space. This is an excellent area where storage options can really pay dividends so plan accordingly. Like all additions, be mindful of getting the correct permits and make sure the professionals adding the garage follow all building codes to satisfy all safety and security concerns. While it seems like common sense, it is important to make sure the new garage does not distract from, but instead compliments the features of the rest of the house, both inside and outside the property. A family room can be a great addition, especially if your family spends a great deal of time together while at home. Whether you are playing games, watching television, practicing on your musical instruments, or doing any number of other activities, a functional family room can add both monetary and long-term entertainment value. Simple features like judges panels, electrical outlets in the floor/baseboards, and well placed lighting can really help sell the functionality of this room. The cost can be considerable so you really need to weigh the pros and cons of why you are planning this type of addition. If after analysis it still looks like a smart investment, do your research and hire experienced professionals to handle the addition. Do not forget to get clearance and approval where necessary. To avoid potential legal, monetary, and neighbor issues take the time upfront to ensure your new upgrade matches your overall home design and is fits in well with the surrounding community. No one wants to spend this much money only to be forced to make expensive code changes so confirm with your local building department you have the correct permits and get sign-off from the local community group (if one exists). These types of projects can easily spiral out of control, both in terms of cost and time allotted so plan accordingly by having a sit-down with your architect to lay out the rules of engagement. With a solid plan of attack, and strong communication between all parties, you have every opportunity to stay on task and on budget. No one goes into a remodeling project with the thought they will lose money during the renovation process. With a little foresight, there is no reason for homeowners to be concerned with the various aspects of remodeling. 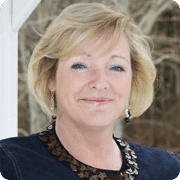 That is especially true if they are confidant about pressing forward, have a firm plan, and are prepared to take on whatever transpires during their home improvement project(s). A successful remodeling project awaits, so jump in and determine if one or more of these items are what you and your home needs. Even a small project can serve your family well as you make memories in the home and leave a lasting impression on buyers when you are ready to sell the place. If you found this article detailing several remodeling ideas to increase home value helpful, please consider sharing it via social media outlets so others can benefit from the information as well. Happy home remodeling! It is a good choice that can definitely see a decent ROI, Robert. Thanks for stopping by. Wrapping up your budget before remodeling each part of your home is important. This way you can plan ahead so that you can create and choose the best ideas for your home. If you’re still having problem this post will give you a hint on how you can keep on a budget while remodeling your home.